If you’ve read through Coffin’s book Making Trousers, the Craftsy class will be familiar to you – it’s basically a video companion to the book. You’ll even see some of the same example garments on display. The pocket construction coverage is extensive. 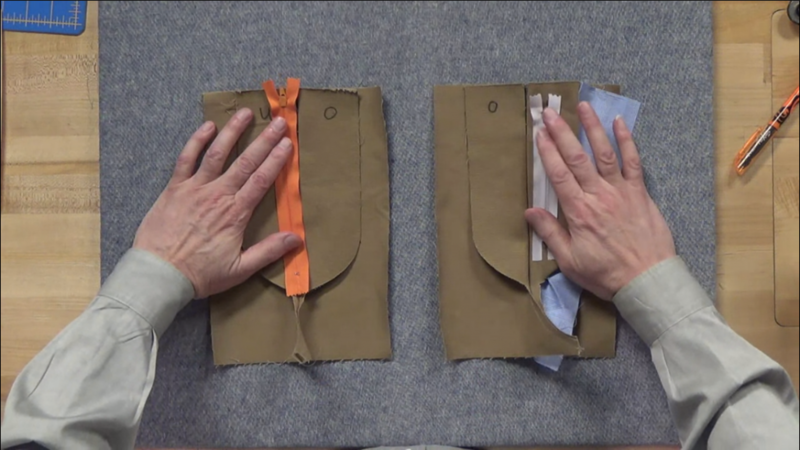 Coffin shows you how to draft your own pocket patterns for any pants pattern, including facings and pocket bags. Then he demonstrates how the pieces go together to make the finished pocket. For welt pockets, Coffin shows only a single welt pocket in detail, since the single welt is actually a double-welt pocket with some special handling – so if you can do single you can also do double. For zippers, Coffin demonstrates two different styles of fly construction, and also deals with how you install a zipper for cut-on versus sewn-on waistbands. This section probably bears rewatching because it’s the most technical section of the course; he works on both fly options side-by-side, at the same time. This is great so you can see how the construction methods compare, but once you decide upon your approach you’re going to concentrate on only one set of steps. In the final class session, Coffin discusses unconventional techniques like waistbands with built-in expansion, as well as zipper enclosures hidden inside pockets. He encourages you to use these techniques, as well as those found in ready-to-wear garments, as a springboard to experiment with your own pants designs. The book Making Trousers comes with a companion DVD, with video mini-lessons. It’s been a little while since I reviewed the content on the DVD, but I would say this is a better presentation of the topics than the DVD mini lessons that came with the book. However, there is content on the DVD that isn’t in this class. If you have the book and haven’t covered that material, you certainly should do so first. The DVD includes some videos for some off-the-beaten-track techniques, such as sewing a keyhole buttonhole on a standard zigzag sewing machine. As the title of this course makes clear, there is no content devoted towards fitting. That might upset some people, but I think it’s wise to limit the scope of the class, since pants fitting is such a complicated subject it really deserves a course all its own. I was disappointed that a few topics from the book were not included; there is no demonstration of how to make a button fly, for example. And there’s some nice tailoring touches Coffin includes in the book, for instance tweaking the lining of a pocket flap to get it to favor towards the inside, that aren’t included here as well. You should bear in mind that in the Craftsy class, Coffin sews samples rather than actual garments. Most of the time I was okay with this, but for waistbands I actually would have liked seeing the entire construction process and the fully finished result. Especially since there are so many ways to structure a waistband – some go fully around the garment, some have seam breaks at the side seam or center back. etc. Finally, Coffin constructs each of the features in isolation. 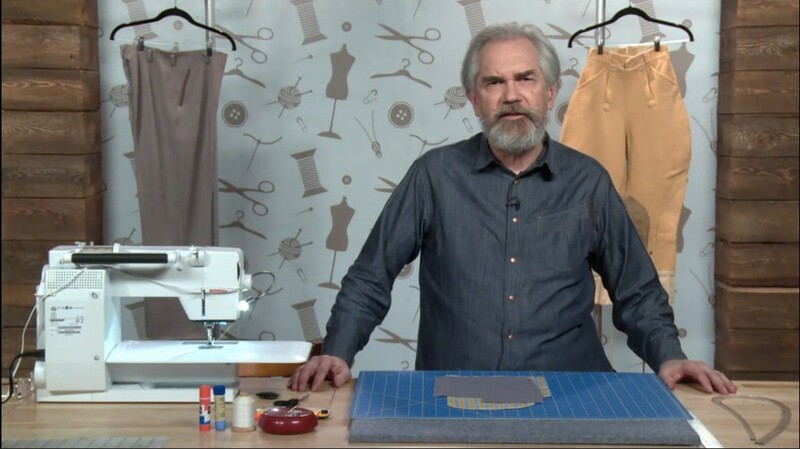 A beginner who’s making their first pair of pants might benefit from seeing the entire construction process unfold from start to finish, including order of assembly. So for that reason I wouldn’t recommend this class to the beginner who’s never sewed pants before. But for an intermediate sewist, it’s an excellent guide to quality construction techniques. Update: The downloadable class notes do include instructions on proper construction order. But I stand by my feeling that beginners would benefit from seeing the process unfold live on video. This class sells for $49.99 at full price. I paid $24.95 via a promotion, and I definitely think it’s worth the price I paid. Is it worth full price? I won’t answer that, because you should never pay full price for a class at Craftsy. For what’s included in this class, and the quality of the techniques presented, I give Pant Construction Techniques: In the Details 5 stars. Thanks for such a detailed review! I heard of David previously from his Shirtmaking book – that received a negative review from a sewing instructor that I respected and it clouded my judgement. I saw this class and I’m always keen to learn so this review has been very useful! Perhaps I should give this class a go. You’re right, craftsy pricing is rather interesting, the full price of the courses is eye watering so waiting for a promotion is always a good idea. ( although sometimes you just want a class now now now! I’m not entirely sure why the Shirtmaking book gets bad press from sewing instructors. I’ve seen some criticism of the book that it’s too opinionated and tells the reader that certain things must be done in such-and-such a way. One example is his advocacy of the hemming and flat-fell feet as “the” way to achieve proper rolled hems and flat-fell seams in shirtmaking. There was a long thread recently on PatternReview where DPC himself took part in the discussion, and clarified that he was not dogmatic on the issue. Conversely, I think some people may dislike his book for the opposite reason – he has some unconventional methods for doing things, including some he’s invented himself, so I think he might get flak because he’s not doing things the “accepted” way. FWIW, the Cutter and Tailor forum (a community of professional tailors) does recommend his book as the best available resource on shirtmaking in print. If he passes muster with that crowd, then there’s something to it. In my view DPC is about experimentation and finding new ways to do things and ways that work for you. I don’t use every one of his techniques, but they are interesting enough to try out and I appreciate his dedication to precision sewing and quality of the final result. Thanks for the review! The course was discounted this weekend so I’ve enrolled and started the lessons. On the Shirtmaking book – I think like any other instruction book you have to take what you like from it. It’s just another tool! The book is invaluable for the instructions for cuffs and collars (the “burrito” method.) A few months ago I found Barbara Hellyer’s Sewing Magic books that DPC references for those methods and they are fantastic. However, I for one just can’t make a rolled hem foot work. I’m pretty good with the iron and just fold 1/4 then 1/4 again, baste it down with glue and have at it. I’ve never tried a felling foot, I do just fine with the old fashioned method (and serge and topstitch the seam allowances on armscyes). We all find out own ways to do it, but hopefully we arrive at an increasingly better product. For collars and cuffs, I started out with the methods from Pam Howard’s Craftsy course, “The Custom Tailored Shirt”. My collars got better once I adopted Margaret Islander’s technique, which I got via Peter Lappin’s writeup at Male Pattern Boldness. The “burrito” method for attaching collar and cuffs that DPC describes in his book sounds really interesting, but I haven’t wrapped my head around it fully despite having the accompanying DVD. I’ve thought about trying out some samples so I can make mistakes and learn the technique, because I’m afraid to experiment that much on a real project. Likewise, I’ve played around with the rolled hem foot, but I’m not ready to trust myself with it on a real project. First of all: Happy Passover/Easter to everything. I purchased David’s Crafty’s course (and a few others) when they had their big 50% sale. I am a true admirer of David. I like his course and is a good complement to his pants book and dvd. He does cover much of the same material as the book/dvd which is kind of what I thought it would be. But it is nice to see him actually doing the class with the opportunity to ask questions. I have been making my own trousers for over 30 years and I found I still am able to pick up on some new techniques from his books and course. I have his first shirt making book. I can understand why it get some bad press. 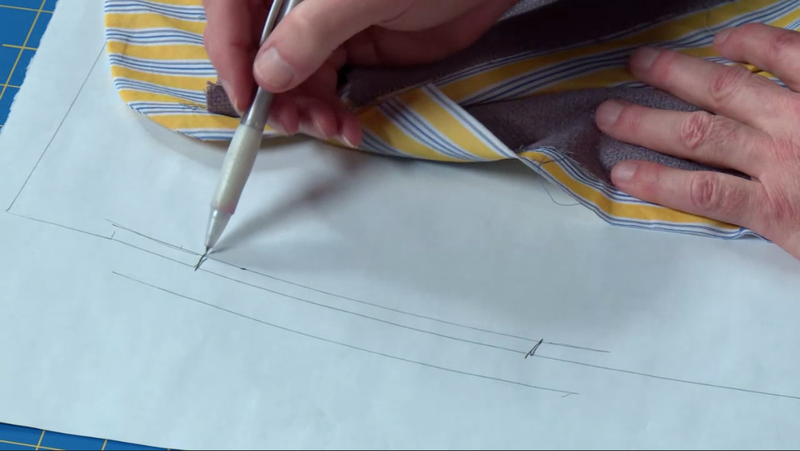 He covers the tailoring aspects of making a shirt (bespoke) etc. however, the book falls short on the direct clear instruction on shirt construction. I have to purchase his other shirt books/dvd, the new one that is coming out and will see how these are in comparison. I would like to see David produce a menswear book/guide for jacket and topcoat tailoring and construction. The market is sadly lacking in modern menswear tailoring, and truely I get tired of the focus on women’s wear all the time. Tailoring: The Classic Guide to Sewing the Perfect Jacket is by Creative Publishing, which is David’s publisher. I highly recommend it! The second edition of the Cabrera book (published 2015) just came out. My copy arrived from Amazon less than a week ago. Selvedge Jeans Pattern for Men!!! I wanted to point out something new by Angela Kane (AT angelakane.com) and also on youtube, she did her first ever menswear selvedge jeans pattern. She has instructional videos and will be doing some additional videos for her first menswear jeans pattern. I don’t know about anyone else, but I was so so excited to see this. It saves drafting my own pattern. Thanks for the tip. I have a cut of Japanese selvedge denim from Britex Fabrics that I’ve been intending to use for a selvedge jeans project. I wanted to take what I learned about pants fitting from the Vogue trousers and apply it towards altering/drafting a selvedge jeans pattern. I’m very interested to see what Anglea Kane has produced. I have a Pinterest board for my project where I have been collecting drafting notes, construction notes and inspiration. The only other place I have seen a pattern for selfedged jeans for men is in the japanese pattern books. I have a few and they have multi-sized patterns for them. If you know of a Japanese pattern book with patterns for selvedge jeans (or any kind of jeans pattern) I’d love to hear more about it. I looked through the shelves at the Kinokuniya bookstore here in San Francisco and did not find anything like that. This is the japanese pattern book it covers everything in pants for men including selfedge jeans. You will be able to tell selfedge jeans when the side seam is completely straight so that it can be cut on the selfedge of the fabric. Thanks. I didn’t find this on the shelf at the local Kinokuniya bookstore, so this Etsy link is super helpful. Hey, no problem. I purchased all my japanese pattern books off etsy. I love them, there is one book i have, i think i am going to make everything in it. All casual sports wear, just great easy to make clothing. I forgot to add the link for the other easy menswear pattern book that i am basically going to make everything in it. I purchased all my japanese patterns from this specific etsy shop. There are also some additional books on sweaters/knitwear .. and yes i know to knit too. The pricing was great and i didn’t have to leave the house to get them. I actually found this book on the shelf at Kinokuniya over the weekend – there’s lots of great stuff in it. I bought a second copy for a blog giveaway I’ll be posting here soon. I look forward to the post, you should do a detailed review on the Roberto book. I am getting busy this weekend and making the Angela Kane Jeans. It is nice sunny today so laundry, sewing and doggie walks/baths. I think I found my last vintage sewing machine that I will purchase. It’s a Viking Husquvarna 21A, green machine from the 50’s fully restored with all accessories. It will be my dedicated “jeans machine” since it has a 1.5 amp motor and serious power. I was seriously inspired by it thru a fellow on youtube, LookingGlassDenim, based in Stockholm, Sweden. He make custom order selfedged denim jeans, jackets and accessories on the same machine. My computer says I need an additional media player, but the link Adobe uses is no longer valid, so I can’t see the videos. I guess this qualifies as out of date software.